Dr. Marisa St. Claire is the Chief Veterinarian in the Office of the Chief Scientist, Integrated Research Facility, Division of Clinical Research, NIAID, NIH. She and the comparative medicine staff are directly responsible for the conduct of in vivo studies in support of animal biosafety level (ABSL) 3 and 4 research for NIAID/DCR/IRF studies, including Select Agents. Dr. St. Claire received her D.V.M. from the University of Minnesota, and her M.S. in Comparative Medicine from the University of Missouri. She simultaneously completed an NIH post-doctoral fellowship at the University of Missouri. She is board certification by the American College of Laboratory Animal Medicine. Prior to joining NIAID, she was a Vice President and Chief Veterinarian for a contract research organization in Rockville MD. Her division employed approximately 75 staff members devoted to the study of viral infectious diseases primarily for NIH, including ABSL3 and Select Agent work. In 2007, she joined NIAID in her current position at the IRF, an ABSL4 facility devoted to the study of high consequence infections requiring high levels of biocontainment such as viral hemorrhagic fevers, MERS-CoV and influenza. The mission of the Comparative Medicine Program is to coordinate and facilitate the conduct of emerging infectious disease and biodefense research in animal models to develop vaccines, countermeasures, and improved medical outcomes for patients. 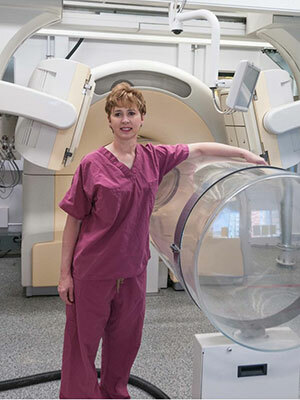 The Program additionally supports the use of hospital tools, such as endoscopy, cardiac telemetry monitors, and Computed Tomography, Magnetic Resonance Imaging, Single Photon Emission Computed Tomography, and Positron Emission Tomography imaging in research. The 2014 Ebola virus outbreak was the largest in history, and the first in West Africa. This outbreak was the first Ebola epidemic the world has ever known, affecting multiple countries in a populous region of the African continent. Three imported cases, including one death, and two locally acquired cases in healthcare workers were reported in the United States. The potential for widespread disease has led to increasing research efforts by the NIH into potential vaccines, countermeasures, and therapeutics. Animal models are critical components in Ebola research, and such work must be performed in the Animal Biosafety Four (ABSL4) facility, the Integrated Research Facility (IRF) at Fort Detrick, MD. Central to the core mission of the IRF is the use of hospital tools, such as endoscopy, cardiac telemetry monitors, and Computed Tomography, Magnetic Resonance Imaging, Single Photon Emission Computed Tomography, and Positron Emission Tomography imaging, to systematically evaluate the pathogenic processes and clinical course of disease in animal models. Caring for animals in such an environment poses unique challenges to veterinarians, technicians and animal care staff. These challenges and solutions will be presented.